The valve regulated lead acid (VRLA) recombinant technology means no watering is required throughout the life of the product, yielding reduced overall maintenance costs. And thicker positive plates help ensure longer life. The battery features a welded/epoxy, dual post seal design which provides the highest integrity seal in the industry. In addition, the welded/epoxy, dual post seal design provides the highest integrity seal in the industry. The large copper post design enhances the high rate performance. Cells are encased in dedicated protective steel cans (modules) that maintain constant, uniform compression for the life of the cell. The easy to use integral handles allow for fast, simple installation even in the most difficult locations. To make installation quick, easy and safer the DDr batteries include integral handles that allow for simple installation even in the most challenging situations. 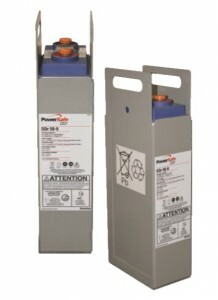 Below is a sampling of our more popular EnerSys PowerSafe DDr Batteries. If you do not see the battery that you need, please call 800.876.9373 or email sales@power-solutions.com.